NOTE: It’ll say check back tomorrow until it’s time. Just refresh the screen. Just a reminder, at 12 noon (Eastern Time)/ 9am (Pacific Time) click here to visit Kraft Mac & Cheese facebook and like them. Then on the “Macsurance” tab, follow the instructions to request a free Kraft Macaroni & Cheese coupon. Allow 6-8 weeks for delivery. If you don’t get it today, no worries because because they’re doing this every day until March 4th. Heh, we broke their page. why was there no coupon? Seems to be gone now. I love Kraft Mac & Cheese!!!! i tried several times to find the coupon. could not get to it… i am very disappointed. Kraft Mac & Cheese YUMMY!!!! love Kraft Macaroni and Cheese! Is this new product or just new package? new packaging.. same great taste! I have noticed that lately when I print coupons out from coupons.com, there is no bar code and the stores will not take them. I just wondered if you knew how to resolve this? Thanks! Love, love , love ! Watched the clock when seconds were left, then it switched to 23 hours! Very frustrated. Love Krafts Macroni and Cheese.Only kind I buy. I love Kraft macaroni and cheese. Thank God it was around when I was raising my kids, because it was a Staple in our house. This is a riot….hits home because my friend watches my son while i go to college tuesday and thursday nights…i said theres mac n cheese n hot dogs for dinner. ….i got a text in class….no mac n cheese…someone must have stolen it. I guess you had to be there. Sorry to say I think the coupon is a scam. No matter how fast I am, I have yet to be able to get “ANYTHING” I do love Mac&CHesse but not the head games for a coupon. I LOVE Kraft mac n cheese and its the one thing i know my kids will always eat without a fight!! 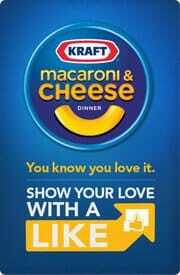 I love kraft mac and cheese and would like it free. Gotta have mac and cheese! we love kraft mac and cheese at our house. My husband is a big kid….loves his mac n chesse. he’s deploying soon Soo i have to stock up on the microwavable one!!!! Gotta love mac and cheese! I think my grandson could live on Kraft Mac & Cheese. When all else fails–he says Nana do you have any Mac & Cheese. My favorite, there is no other! Would LOVE a Coupon for a free Kraft Mac & Cheese it’s the best! Love Kraft Mac and Cheese!! love kraft. a box would be nice. Love that Mac and cheese! Mac & cheese — yummy! gone is less than 1 minute. When I finished filling out form they were all gone. My grandson loves Kraft Mac & Cheese. Thank you for the reminder. I made it to the site just in time to sign up for a free box. I NEVEWR GET THE REQUEST A SAMPLE WHAT DO I DO? I have trouble keeping Kraft Macaroni & Cheese in the pantry. The family loves it so much. We would love to get a stockpile of this yummy Kraft product. The best mac an Cheese EVER! just love kraft mac n cheese the only kind i eat..
We love Mac & Cheese!!! I LOVE, LOVE, LOVE Mac and Cheese! is there any other kind of Mac & cheese? NOT!!!! Me and my family love Kraft products! my grandson sons love it!!! Worst giveaway ever! It causes way too much stress and there is no result! It is so hard to get in, But I love Kraft Mac & Cheese! Kraft MAC and cheese is the BEST! I like the spirals most. Our family loves macoroni and cheese. Kraft is the only one we like. My kids stuff. Thanks Kraft !!! We pretty much live on Kraft Macaroni & Cheese . When we can aford it. My family and I love your macaroni and cheese. Please send us a free sample. Like your Mac and cheese. It’s delicious. my family loves mac and cheese. You gotta love Kraft Mac and Cheese!! THIS WOULD BE AN ALL TIME FAV OF MY FAMILIES!! love love Mac n Cheese!! My daughter loves the blue box, it’s the cheesiest! I just love anything Kraft.. Please send me a coupon for a free box of Kraft Macaroni and Cheese! One of my families favorites, goes with everything. love Kraft macarni & cheese!! My son would be happy to get a box. I have been trying to get this sample for DAYS! Please tell me what I’m NOT doing or what I’m doing wrong. My whole family,adults and kids alike, love Kraft Mac and Cheese! We LOVE Mac & Cheese!! NEVER EVER any left over!!! My 3 teens and I love Kraft Mac n cheese! I loved Kraft mac and cheese. I love Kraft Macaroni and Cheese its the cheesiest.